By Grubs, April 30, 2016 in Australian Caridina spp. This is a bit of a serendipitous project. 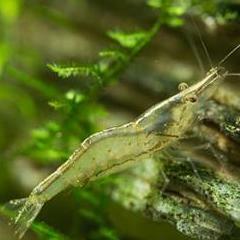 I've been breeding Darwin Algae Shrimp (DAS) Caridina sp. NTnilotica for a while now using salt water algae cultures to raise the larvae. 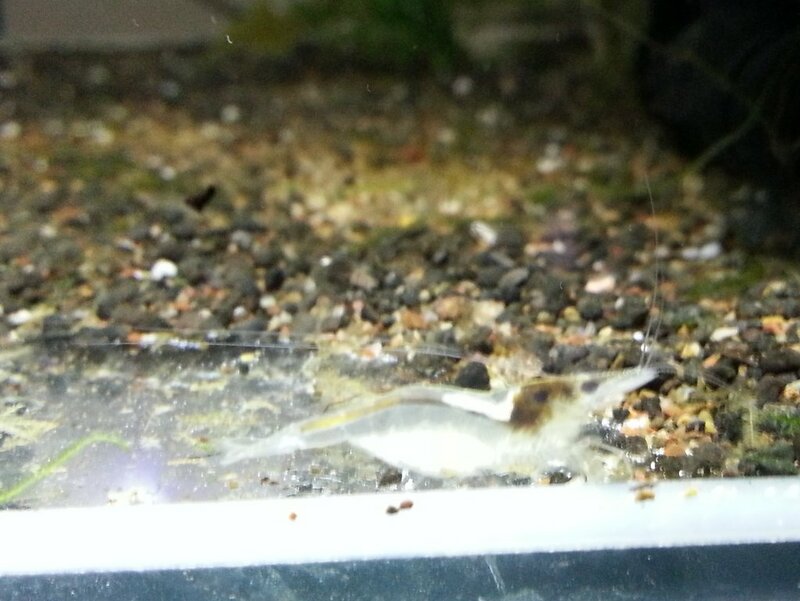 I'm up to the F3 generation (since I got them from Aquagreen) and have raised a few hundred shrimp. The normal colour is the horde in the photo below (swarming on an algae wafer)...but recently I've noticed just a few berried females that are white with metallic eyes. I thought at first it might be that they have just moulted - but the saddle suggests otherwise, and tonight I isolated one that has released swimming larvae (I caught a few to try and rear) - so she has stayed white for long enough for the larvae to mature. All up I only have 3 white females and 2 males ... but hey thats enough! The males are just clear, but have the same eyes which really shine when viewed at night with a headlamp so easy to identify them among the herd. That's awesome, we should do more selective breeding of our natives to see what we can achieve. Wow that's a really cool colour variant. Keep us updated as to how you go with them long term. That's such a cool, yet weird colour for eyes. ? Wow, the eyes look amazing @Grubs, well done on your breeding efforts with the DAS ? In daylight without the eye shine... what a beauty! I think this is the same shrimp as in the first post above. She's released the larvae and been re-fertilised or was still packing sperm from before (I think shrimp do that) and the saddle has become another batch of eggs. You can also notice she has not eaten (head and gut is clear)...hopefully not a problem. 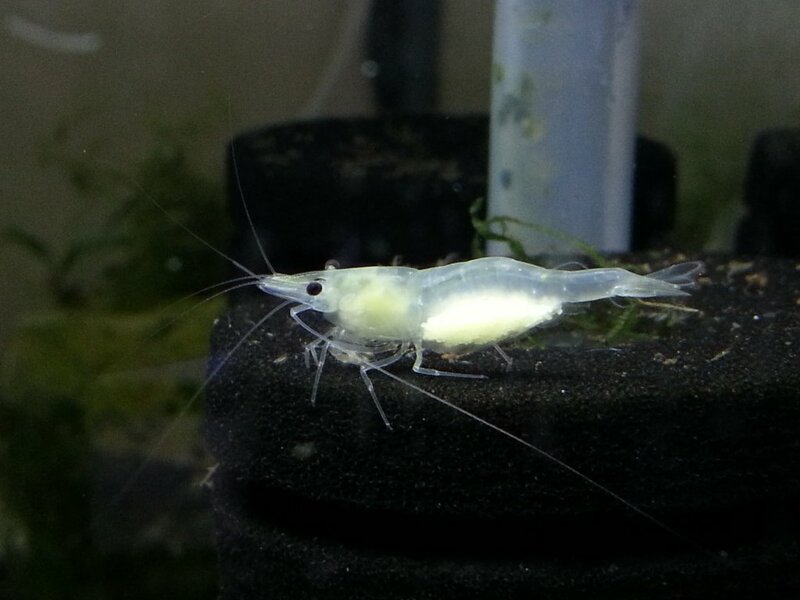 I'm assuming for now that after a shrimp moults it doesnt eat for a while until all the "eating bits" have hardened up... at least that seems logical to me. Compare to the shrimp below. (terrible photo sorry!). This one below has the clear body and white eggs also and I think that brown smudge at the back of the head is the stomach and you can see the "poo chute". If not eating I expect it would be pretty like the one above - its something I'll watch for! This is really really cool! Good luck with the project - I hope it's a heritable trait!! This one above is a mature female (right). The others are all normal DAS. There is a little juvi "platinum" just behind the tail of the big one exiting stage right. Hey @Grubs, any update on these guys? Hope they breed true for you. I had some white threadfins that I tried to line breed to get more white fish. Nothing. They were not albino. 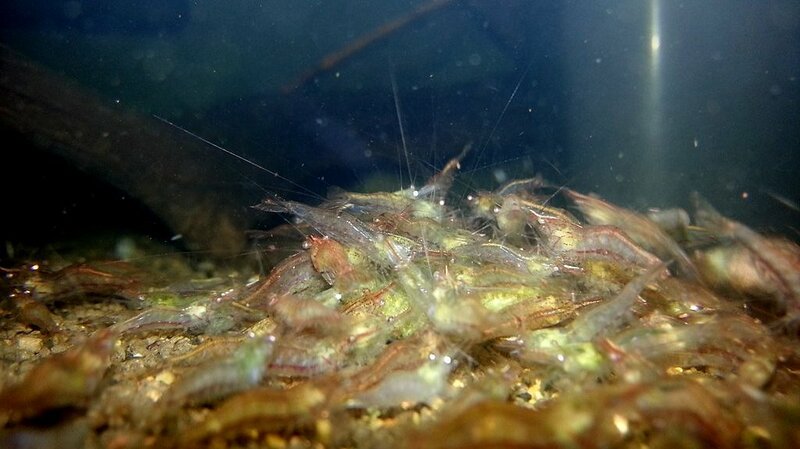 Go To Topic Listing Australian Caridina spp.